PANJIM: “We don’t inherit the Earth from our ancestors, we borrow it from our children”, so goes an old native American proverb and how true that may be if one could gauge the sequence of events playing out in Goa today. 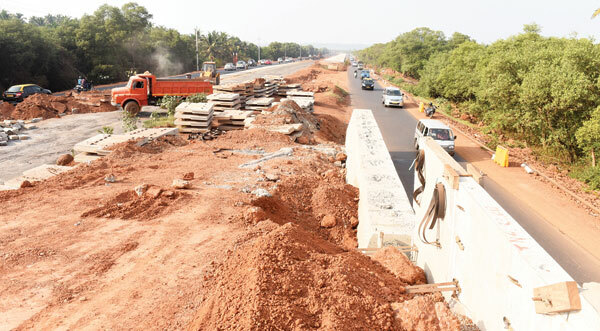 The construction of the third Mandovi bridge and the four/ six lanes of highway from Panjim to Bambolim has seen the contractors mercilessly destroying the environment. Residents feel in the coming years the villages of Merces, St Cruz as well as Bambolim will face the impact of the destruction. As one leaves from Panjim KTC bus stand, it is seen that the mangroves on both sides have been cut and the river filled for approach roads up to the Merces circle. Thereafter the fields and so also mangroves are filled with mud up to Bambolim slope, where number of age old trees have been cut. “This is a wholesale destruction of environment taken up by the government,” says former GU scientist Dr Joe D’Souza. The environment destructions of filling the agricultural land and the river will have a catastrophic impact on the eco-system, D’Souza adds. Another local from St Cruz David D’Costa says development is needed but not at the cost of nature. “The development has to be sustainable, here the villages are divided and people will have to travel hundreds of meters to reach the other side,” he said. Another local Anastasio Fernandes says, “we have seen the trees near Bambolim slope for ages but now they have cut everything in one go. Will mother nature forgive us for this sin? He asked. Locals also fear the fields on the St Cruz and Merces junction were catchment areas in rain and the filling might just cause floods in monsoons in the areas.